The only Palestinian Orthodox Christian bishop in the Holy Land speaking about the suffering of Palestinian Christians, their unity with Muslims in the Palestinian struggle, about Orthodox Christian martyrs, and Ukraine. 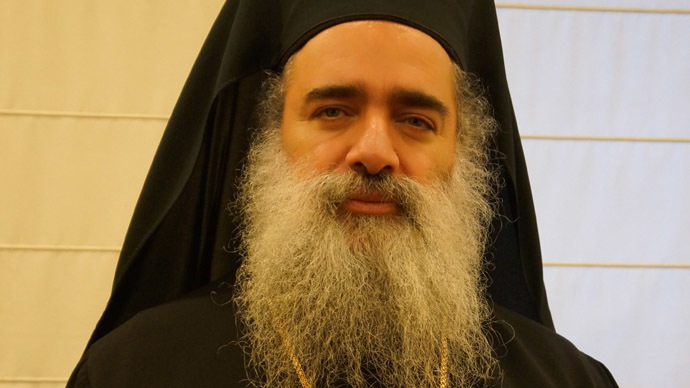 Archbishop Sebastia Theodosios (Atallah Hanna), 49, is the only Orthodox Christian archbishop from Palestine stationed in Jerusalem and the Holy Land, while all other bishops of the Patriarchate of Jerusalem are Greeks. The Israeli authorities had detained him several times, or stopped him at the border, and taken away his passport. Among all Jerusalem clergymen he is the only one who has no privilege of passing through the VIP gate in the airport – because of his nationality. “For the Israeli authorities, I am not a bishop, but rather a Palestinian,” explains his Beatitude. When talking on the phone he says a lot of words you would normally hear from a Muslim: “Alhamdulillah, Insha’Allah, Masha’Allah”. He speaks Arabic, and the Arabic for ‘god’ is Allah, whether you are a Christian or a Muslim. Your Beatitude, what’s it like being the Palestinian bishop in the Holy Land? Firstly, I’d like to confirm that I am the only Palestinian bishop in the Orthodox Patriarchate of Jerusalem. A fellow bishop is serving in the city of Irbid in the north of Jordan; and there are also several Palestinian priests. I take pride in belonging to this great religious institution that’s over 2,000 years old. My church has been protecting the Christian presence in the Holy Land and the sacred items related to the life of Christ and Christian Church history. I am proud of my religion and nationality, I am proud to belong to my fatherland. I am a Palestinian, and I belong to this religious people who are fighting for the sake of their freedom and dignity to implement their dreams and national rights. I support Palestinians and share their cause and their issues. We the Palestinian Orthodox Christians are not detached from their hardships. The Palestinian issue is a problem that concerns all of us, Christians and Muslims alike. It’s a problem of every free intellectual individual aspiring for justice and freedom in this world. We the Palestinian Christians suffer along with the rest of Palestinians from occupation and hardships of our economic situation. Muslims and Christians suffer equally, as there is no difference in suffering for any of us. We are all living in the same complicated circumstances, and overcoming the same difficulties. As a church and as individuals we protect this people, and we hope a day will come when Palestinians get their freedom and dignity. For those coming to visit the Holy Land there are few opportunities to see how hard the Palestinians’ situation is. What would you like to say to those wishing to understand better the Palestinian problem? The Israel authorities treat the Palestinian people in a way we can never accept or approve, first and foremost because Israel treats Palestinians as foreigners, as if we were strangers in our land. Palestinians have never been strangers either to Jerusalem or to the entire homeland. Israel is an occupation force which treats us as visitors or some temporary residents. But we are the native people of this land. We didn’t come here, we have always been here. In contrast, Israel appeared out of the blue. They are treating us as if we came here from elsewhere, as if we accidentally and recently strayed into this land. But we are the rightful owners of this land. We didn’t intrude into Israel. Israel intruded into our lives in 1948, and in 1967 it occupied Eastern Jerusalem. We have been here long before Israel. By the time Israel came here, our forefathers had been living here for many centuries. This is why we cannot accept Israel treating us like strangers to our own homeland. I shall be honest and say it over again: both Christians and Muslims suffer the same from the Israeli authorities. Is visiting Jerusalem as difficult to a Christian Palestinian from the West Bank as for a Muslim? The pass allowing a Palestinian to enter Jerusalem is issued by Israel. No one can come through without one. In pursuing its racist policy towards the Palestinian people Israel disregards different confessions. We are all targeted just the same. It all depends on getting a pass, whether you’re a Christian or a Muslim. We all are their targets. On top of that, Israel took control of a lot of property of the Orthodox Christian Church and is interfering with the internal affairs of the Church. They put pressure on the Palestinian Christians in all sorts of ways trying to force them to leave. There is only one cause of suffering for both Christians and Muslims in the Holy Land. The recent attack on the French satirical magazine triggered a wave of anti-Muslim marches in Europe. Netanyahu walked in the front row of such a march. What it your attitude to what happened? We denounce the attacks in Paris which were committed by the people allegedly representing a particular religion. But they do not represent any religion – they are murderers. This attack was committed by the people, who claimed to have faith, but they definitely don’t represent Islam and cannot act on behalf of Islam, they only do harm and hurt the image of Islam through what they do. At the same time, we denounce just as much terrorist operations in Syria and Iraq as we denounce the terrorist attacks in Paris. Those who committed the terror attack in Paris and elsewhere, belong to the same groups that are engaged in terrorism in Syria and Iraq and attack sacred places, desecrate churches and kidnap religious leaders. They attack women and children in Syria, Lebanon and Iraq. We were witnesses of the terror act in Lebanon’s Tripoli just days ago which killed dozens of innocent people who were at a café. We condemn the terror attacks in Paris and we equally condemn any such attacks in any part of the world. We strongly oppose the idea of connecting these attacks to Islam. We are currently preparing for an international conference that religious figures – Christian, Muslim and Judaist – from many countries will take part in to assert that we, the representatives of the three monotheistic religions, are against terror, fanaticism and violence used under religious slogans. The conference might take place in Amman, Jordan. To a Western mind, Allahu Akbar sounds like a threat. What do Christians of the Holy Land think about them? Do people say Allahu Akbar in church? Is this all about Christ? Was he the one to provoke a religious split in the Holy Land? Christians and Muslims recognize that Jesus Christ had been born, and they are awaiting his second coming, and the judgment day. Jews deny this however, and await their Messiah. We Christians believe that Jesus has already come. We have recently celebrated Christmas as a reminder that Jesus came into this world, that he was born in Bethlehem, and began his road here in the Holy Land for the sake of all mankind, and for the salvation of the world. So as far as we are concerned, Jesus has already come. Jews believe that he hasn’t come yet, and await his coming. This is the main disagreement between Jews and us. We believe that Jesus has already come, whereas they don’t. Despite this fact, we are not at war with Jews. We do not express aggression against Jews or anyone else in the world, despite any differences in our beliefs. We pray for those who disagree with us. When Jesus came into this world he didn’t tell us to hate, ignore, or be at war with one or the other; he didn’t tell us to kill this one or that one. He gave us one very simple instruction: to love one another. When Jesus told us to love one another this love wasn’t conditioned by what a person was like, or what he was doing. If we are indeed true Christians it is our debt to love all people, and to treat them with positivity, and with love. When we see someone who’s sinful, lost, and distant from Allah and from faith, someone who acts wrongly, then it is our duty to pray for him although he might be different from us and our religion. When we have religious disagreements with people we pray that Allah would guide them the right way. Hatred, anger, and accusations of having a wrong faith are not a part of our ethics as Christians. This is the key disagreement and difference between the Jewish religion and ours. The Jewish religion that had existed before Christ is the religion of people who were awaiting Jesus’ coming. Many Jews followed him, yet there were those who didn’t believe in him, and rejected him. We know that Jesus was persecuted, and so were the early Christians. For instance, Herod the King killed thousands of babies in Bethlehem thinking that Jesus would be among them. The book of the Acts of the Apostles, as well as sacred tradition, talk about numerous instances of persecution of early Christians. Despite that, we see each person who disagrees with us on religion as our brother, our fellow human. Allah created all of us, he gave us life, therefore it is our duty to love each person, and to pray for those who are mistaken or are misunderstanding, so that Allah would guide them the right way. Is that why Christians and Muslims are persecuted? We don’t divide the Palestinian people based on who is Christian and who is Muslim, who is religious and who isn’t, who is left or what party they are a member of. We don’t divide the people based on convictions and religion. For the resistance it doesn’t matter whether they are Muslim or Christian. Regardless of what their political views may be, all Palestinians actively support the idea that the Palestinian people should be able to exercise their rights and achieve their dream. Yes, a number Christians have been killed since 1948 to this day. Some Christians have been driven away from their houses. Some Christian villages have been completely destroyed, and now there’s not a single house or resident there, for example, Al Galil in the Golan Heights. Many churches have been attacked in Jerusalem; there have been attempts to seize their property and lands. There are Christians in Israeli prisons – not as many as Muslims, but there are some. The Christian community is smaller in general, but we have our own martyrs who were killed and prisoners who spent years and years behind bars. Christians suffer under the Israeli occupation just the same as Muslims – the entire Palestinian population suffers under it. They don’t distinguish between us. Are there any special aspects when it comes to Christians living in the Holy Land? Here’s one of the many examples, connected to the Russian Orthodox Church. The Holy Trinity Cathedral located in the western part of Jerusalem belonged to the Russian Orthodox Church, but after 1948 Israel used the situation in Russia to its advantage and seized some of the buildings around the Cathedral, using them as police quarters and a prison with torture practices. When someone says “moskobiya”, referring to something connected to the Moscow Patriarchate, something holy and spiritual, the first thing that comes to the mind of a Palestinian living in Jerusalem is torture, police, interrogation and prison. In Nazareth, for example, the word “moskobiya” is associated exclusively with the old Russian school where the Palestinian cultural elite, scientists and politicians studied. Although it was closed after the 1917 Revolution in Russia, its fame lives on. So it’s only for the Palestinians in Jerusalem. 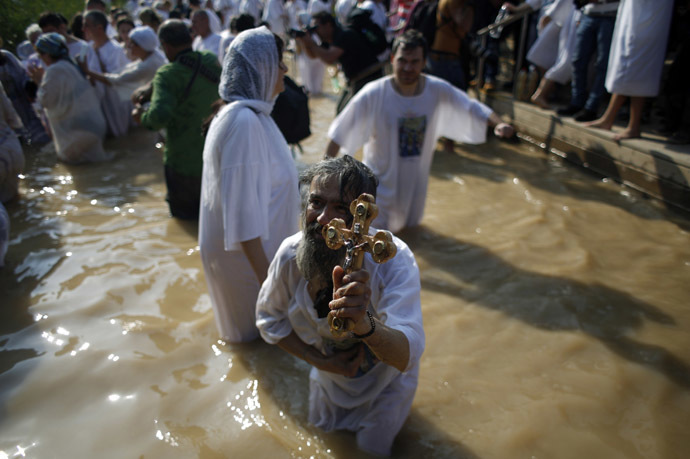 What do Palestinian Christians, I mean Orthodox Christians first of all, think of the Ukraine crisis? Overall, we are deeply concerned with the divide in Ukraine. We still believe all Ukrainian Christians must stay within the fold of the Mother Church that is the Moscow Patriarchate. I wish the Ukraine crisis would resolve through dialogue so that we see reconciliation and an end to violence and bloodshed. Christians do not need wars, killings and massacres. This political crisis must be resolved in a peaceful way. The Church must work hard to ensure that the divisions are bridged and overcome. The Orthodox Church in Ukraine is strong because most of the people preach Orthodox Christianity. Divisions must be healed. We really hope that the efforts by the Moscow Patriarchate and the Patriarchate of Constantinople will help to re-unite the Ukrainian Church. I believe the split can be reversed and those who broke away could come back. But in order for that to happen we need humility, belief and strong will. We pray for the Orthodox Church in Ukraine.